Let us begin with some recent astronomical images, and then take up the issue of measurement scales in those images. See Phil Plait's good collection of the best astronomical images of 2006 here. Few of the images have a scale of measurement built into the beautiful picture, yet the sizes are deeply interesting. Go to the original sources cited by Plait for helpful details and explanations. A very nice collection. If you need a daily fix, the Astronomy Picture of the Day from NASA provides, as the name implies, a new picture daily, and an archive going back 11 years at <https://antwrp.gsfc.nasa.gov/apod/archivepix.html>. Many are amazing, but a scientific image isn't a scientific image unless it has a scale of measurement. Might it work to project the 2-d scale in to 3-space, by drawing it as an isosceles trapezoid? The wider bottom length would represent the scale toward the foreground, with the narrower top corresponding to further back. Positioning and size could be problematic, but in the first Saturn image, a scale trapezoid might go to the left of the planet. A possible variation would be to show just the top and bottom lines of the trapezoid, in effect duplicating the 2-d scale at different points in 3-space. Call out a specific element, via annotation perhaps, and state its size. The call-out should be imbedded in the image. Tie an object of known size to the image. For example, the diameter of Earth isn't all that much greater than the Cassini division. That tells a lot about Saturn's size; also the Cassini division shows a foreshortening perspective effect and thus the scale is carried around Saturn in perspective. Show the changing size of the Earth dot at a number of prominent locations in the depth dimension. Imbed some text about size into the image itself: for example, the diameter of Saturn is about 120,000 km or 75,000 miles. Or 00000 Earths would fit into Saturn. Place the Earth dot on Saturn. If one dimension is stretched, show the original unstretched image and the stretched image. Center a 3-dimensional scaling tripod at Saturn's center. Allow viewers to flip back and forth between a scaled and unscaled image; or place them adjacently. Retain scaling during zooms; might well use contextual zooms. All the scaling lines should be thin and graceful. Don't worry if now and then the background washes out a faint gray dimension line. Indicate color shifts due to optimized false color. There's probably no such thing as true natural color but some colors are closer than others. Show multiple colorized images to give viewers some sense of color variation resulting from Photoshop. Do at least as much Photoshop (+Illustrator) work on showing scale information as is now done on colorizing, one-dimensional stretches, and collaging various images into one presented image. For human-size objects, place the Lascaux hand stencil or the Pioneer plaque people nearby as appropriate. Use logarithmic scales when appropriate. Build scales that can be photographed into vehicles that explore other planets, just as an archaeologist places a meter stick or a hammer in photographs. Have exploration vehicles on other planets leave a measuring-tape trail behind that appears in at least some photographs of the planetary surface under exploration. There are surely exemplars from architects, perspective theorists (who place humans at various distances in perspective drawings), and astronomical photographs. Early on in the text accompanying images provided several ways of thinking about the scale and location of the imaged objects. Imbed basic scaling information in the image itself; otherwise scaling information may well be dropped as the image is reproduced and distributed. Don't let the PR staff or communications experts or similar have any control at all over built-in image measurement scales or any other image-processing moves. Use the excellent technical tools of graphical design to create the scaling information but avoid the attitudes of designers or commercial artists. Quantitative documentation of images is a matter of scientific integrity and teaching about measurement, not pitching. Astronomical images don't need pitching. There are difficult technical issues of graphic design in showing scales of measurement: the images have very high apparent resolution compared to clunky-looking typography and jagged lines placed near the images. There needs to be a lot thoughtful design work to imbed scales of measurement successfully into the beautiful images. The scaling devices should be in the background and often on the periphery of the image to avoid the thick-pencil clunky look of many measurement scales. Elegant scaling of images will require investments at the level of current investments in image processing, colorizing, collaging, and other now-routine manipulations of images. Systematic built-in documentation of images provided to the public is part of NASA's teaching role: scientific work not only shows things but also measures things. The endless stream of beautiful but dequantified images suggests that scientific research is merely about image-making, not measurement. NASA should raise the level of scientific discourse--and should avoid pandering to the prevailing dequantification in pop astronomical imaging. It is essential that basic measuring scales be built into the images themselves, so that quantitative documentation is persistently maintained throughout the chain of image reproduction in newspapers, the internet, television, and astronomy textbooks. If basic quantitative documentation is placed in text separate from the image, the documentation will often be dropped in the process of reproduction and distribution of the images. Some of the most interesting material in astronomical imaging is often the sizes, location, and context of the image. Perfection is the enemy of the good in setting scaling rules. There's is already a big gain in just having rough approximate scaling compared to no scaling. Settle for being approximately right, rather than foregoing scaling because it is not exactly correct. One image can't do it all. I haven't tried this application, iPhotoMEASURE, out yet, but you might find it useful: Place a calibrated sheet of paper in sight of the camera, take a picture, and the software endeavours to measure everything in the view, presumably by making assumptions about what objects are rectangular. Here's a good movie of Saturn tilting for the least 4 years, as the rings eventually move edge- on to Earth, a phenomenon which baffled Galileo because his earlier view of the Saturn's rings disappeared. During the the movie, it is informative to remember that the Cassini gap is only slightly smaller than the diameter of Earth. (and go to the archive for February 9, 2007). on the words for scaling astronomical objects. Astronomical only by association with Polynesian navigation, but an interesting case study might be representing the voyage of the Hokule`a and Alingano Maisu from Hawai`i through Micronesia and ultimately to Japan. Very small points in widely disparate locations make it difficult to display both the entire voyage and the names and distinct locations of islands and canoes. A second discussion could be had, if one was so inclined, about the medium rather than the message. As useful as Google Maps and Google Earth are, they don't seem great for even casual marine applications. How about a solar system scale somewhere in this NASA/Hubble image? How about the number of solar systems across along a central axis? It is likely a lot of image processing went into making the image. With a relevant scale of measurement, the image be processed can move from away from story-telling (like, really awesome, dude) and toward scientific imaging. Now if news reports will carry the scales. A good start would be that the scientific images provided to journalists contain scales built into the images such that publishing the image resulting in publishing the scale. Below, a postcard from the California Department of Food and Agriculture to residents of California. Note the weevil-dime scaling and the credit lines to the photographers imbedded in the images. A planetarium show I saw a couple of days ago had an ancillary display of possibly one of the most misrepresented images in all of science--the Earth-Moon-Sun scale. Here are some web pages for scale-model solar systems: UK, Washington D.C., and a meta-model from the Exploratorium. I can't remember now where the gauntlet was thrown down that it is nearly impossible to represent both the sizes of the planets and their distances in a single view, but Guy Ottewell makes a highly laudable effort in The Thousand-Yard Model. Ottewell's Astronomical Companion might also be of interest to other readers of this site. Excellent Saturn images. Scaling information usually in accompanying text or in technical report linked to image. The Sagan Planet Walk in Ithaca, NY, does a pretty good job at a scale of 1 to 5 billion. It might be hard to see the planet obelisks from the pictures, but each one has a glass disk with a dot representing the planet to scale and text that essentially says, "Look how effing small!" When they installed it, there were vague rumors about putting an Alpha or Proxima Centauri monument on one of the Hawaiian islands. However, using the fascinating GPS Visualizer and piping the output to Google Earth (or string on a globe), a band representing a distance from 4.2 to 4.3 light years just misses too far. Notable cities within the band are Istanbul, Athens, and Rio de Janeiro. I volunteered to supervise construction, but I never heard back. I don't think I've ever considered illustrating an angle not to scale. The illustration is probably helpful to anyone who hasn't taken a college astronomy course, though the angular scaling issue may so unusual that it is worth at least seeing what it would look like to add "angle" before "not to scale". I will admit I got thrown because I didn't realize the diagram doesn't represent the angular displacement between the galaxies, like this. This brilliant single-column graphic showing the size of a microbe on the frontpage of The New York Times recently won an SND design prize. Can someone check the scaling out for accuracy? If anything the black segment is a bit small! Assume that a period as printed is 0.3 millimetres (12/1000 inch) in diameter. This is 300,000 nanometres. The microbe is 200 nm in diameter, so a period is 1,500 times the diameter. If you print the white dot at 0.3mm then the enlarged period should be about 450mm in diameter, or about 18 inches! A hagfish egg with a 14.3-mm pharyngula-stage embryo inside (arrows). Scale bar, 5 mm. The blogger has provided the needed information, but wouldn't it have been better for the writer of the original paper to have integrated it into the image? To be fair, this is the first image (a) of a multiple, so it would have been redundant to have put the same information in all of them, on the chance that any of them might have been reproduced in another article. In answer to Rob Simmon's question: yes I think the little angle diagram explains what is going on in the image very well indeed. The ratio of the galaxy sizes even matches up between the two images. I would suggest the wording: "Angles exaggerated for clarity" rather than the more cryptic "Not to scale". Perhaps lighten up the arrows marking the angles, and add representations of the galaxies. Tom, I believe the problem is what to do when one's image actually has a strong depth of field. I don't think that retouching it in order to present comparable objects as if they were at the same distance is an acceptable solution. 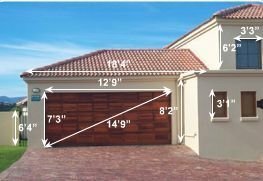 Instead, the image should be left as it is, and separate measurement scales provided to gauge the size of objects at different distances. I for one would like to see a photographic image in which Earth is in the far distance and Saturn in the near distance *stay* that way and not be distorted, just as I would not tolerate a photographer blowing up a horse in the far distance just in order to show it next to a house in the near distance. and (3) placing an object of known size in the common visual field. At Hogpen Hill Farms LLC in Woodbury, Connecticut we've just planted a lot of bamboo, which came from Boo-Shoot Gardens LLC in Washington. Boo-Shoot Gardens has produced excellent label cards for their bamboo, which scale the height of the full-grown bamboo variety with a dimension line and with an object of more-or-less known size, a panda bear. Perhaps scientific images could strive match the Boo-Shoot Gardens standard. Shown are the varieties planted at Hogpen Hill Farms this spring. Here is a great, properly scaled, image of a 70,000 year old engraving fashioned by a human living at the Blombos cave at the Southern tip of what is now South Africa. Note how fine this geometric pattern is - the product of manipulative skill and fine motor control essentially identical with that of any modern engraver, calligrapher, typographer, watchmaker, artist or scientific instrument maker. "the decisive step was taken: the hand became free and could henceforth attain ever greater dexterity and skill, and the greater flexibility thus acquired was inherited and increased from generation to generation." Friedrich Engels. The Part Played by Labour in the Transition from Ape to Man. Die Neue Zeit. 1895.